James wrote today’s key verse during a time where the Christians had allowed the frustrations and annoyances of life to steal their optimism and joy. But in their defense, these believers had a lot of serious and justifiable reasons to have a bad attitude. They faced great persecution, unrelenting trials and sufferings — from murder to imprisonment — at the hand of Saul, who was zealous in his efforts to destroy the church and anyone associated with Jesus. As a result, these Christians were juggling an array of emotions, including fear, mourning, confusion, loneliness and even hopelessness. Some fled their homes in fear for their lives. They lived in poverty, forced to scrounge for food to survive. Some were sick, and everyone was exhausted. They had every right to be negative and pessimistic. I can only imagine as they sunk under the weight of seemingly insurmountable problems and fears, that their faith might have been sinking, too. James acknowledged their suffering but also wanted to give them hope and encouragement. He told them inner joy could still be theirs, if they deliberately chose to take control of their thinking and change their attitude. He encouraged them to pause and refocus on their faith. When life gets hard, it’s difficult to avoid letting a bad attitude take over our minds and rule our lives. We might not experience religious persecution as those first believers did, but let’s face it: People hurt us, the past haunts us, coworkers mistreat us, parents don’t love us, friends don’t consider us, spouses don’t honor us, children don’t appreciate or respect us, finances don’t support us, and our health doesn’t sustain us. James’ instructions to the believers of his time can help us, too. I closed my Bible, realizing my attitude was my choice, and knowing whatever circumstances I faced didn’t have the power to dictate that attitude unless I let them. Although enduring problems with a smile and pure joy in our hearts can be difficult, doing so not only helps us become stronger believers, it opens the door for an attitude transformation. 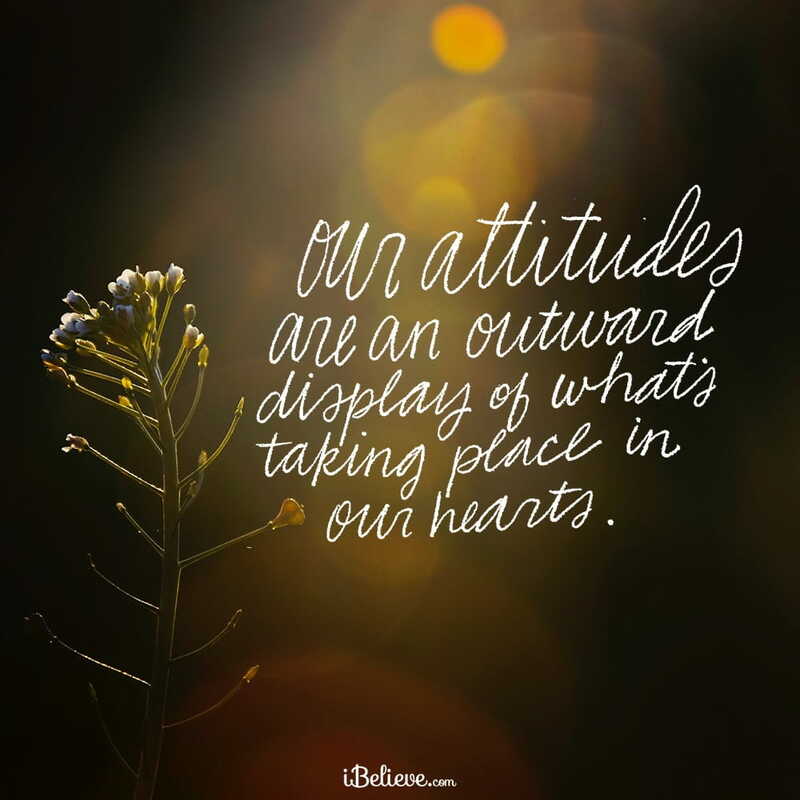 Our attitudes are an outward display of what’s taking place in our hearts. When our hearts focus in the right place, our attitudes will, too. The only thing we have to lose by choosing a positive attitude is a negative one. Lord, free me from the shackles of a bad attitude. Work in my heart and mind to transform my thinking from negative to positive — despite the struggles I face. Fill me with a joy that can only come from You. In Jesus’ Name, Amen. Editor’s Note: Content taken from the Encouragement for Today devotional, “Don’t Let a Bad Attitude Rule Your Life,” written by Tracie Miles. You can read that piece in full here. All rights reserved.